Last July (2006), my lovely significant other and I voyaged down almost all of Illinois Route 66, including most of the variant routes. This created such a massive influx of photos that I more-or-less choked on them as far as doing a linear set of posts like I did for Route 66 in California, and have only been cherry-picking from them ever since. We did make some nice finds, though. 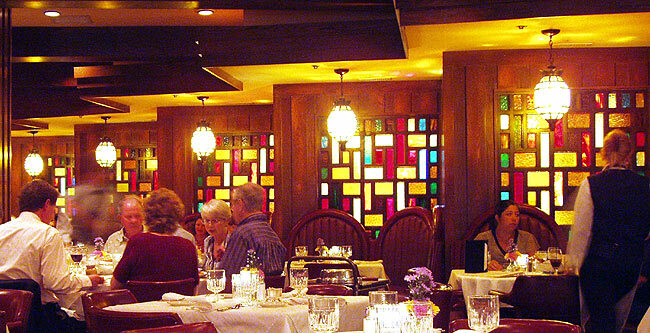 I tend to judge restaurants - especially steakhouses - on the degree to which they look like the swankier places my parents might have visited back in the day before Sirloin Stockade was the steak place in most towns. 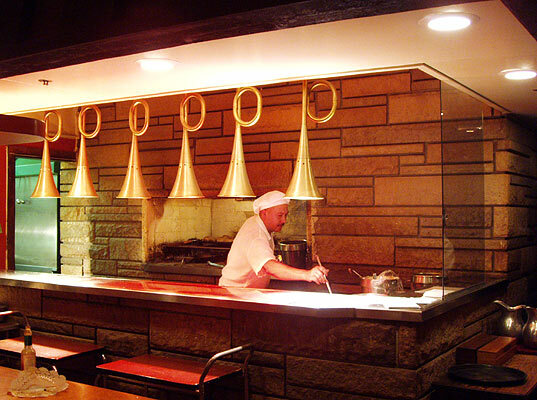 I've been lucky enough to enjoy a few places that live up to my quasi-rat pack standard, including the Cattleman's Cafe in Oklahoma City, Zeno's in Rolla, Missouri, and Rod's in Williams, Arizona. 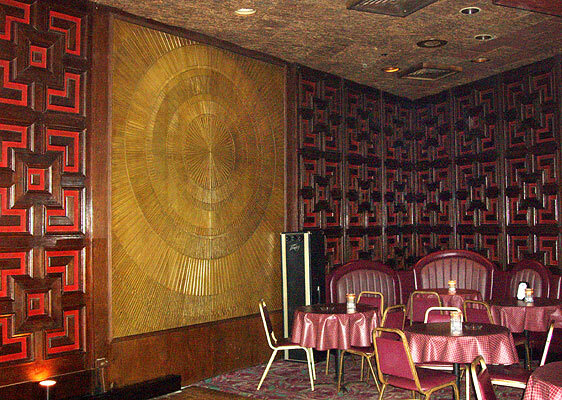 I have dim memories of Keller's Barbecue and Lee's Steakhouse on Route 66 in Joplin and I long for a night out in their mid-century splendor - never mind that my nostalgia conveniently forgets that such places would almost certainly be too smoky for me to enjoy. 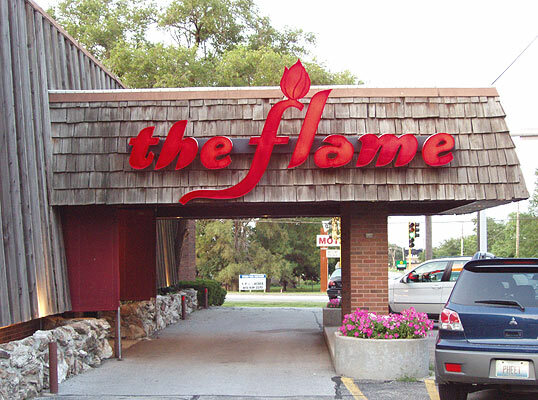 One place I've visited that I'd really like to investigate further is The Flame restaurant in Countryside, Illinois, which will be 50 years old next year. I should note that although The Flame's website lists it as being in Countryside, the United States Post Office lists its zip code as belonging to La Grange. 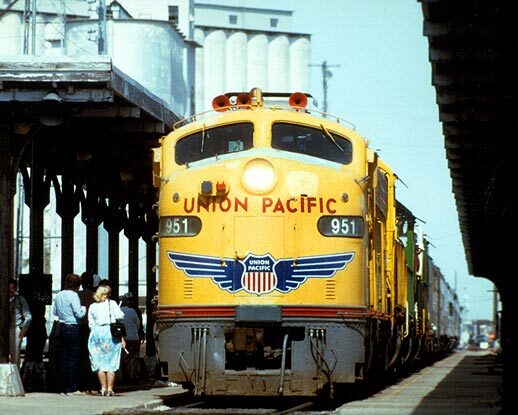 La Grange is best known to railfans as the home of General Motors' Electro-Motive Division, the birthplace of so many classic diesel locomotives. 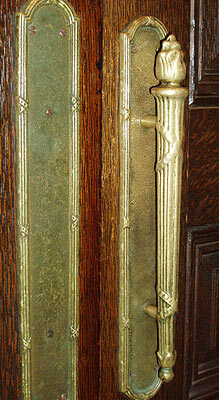 Back to The Flame - I'm coming to regard custom front door handles on a restaurant as a good sign. 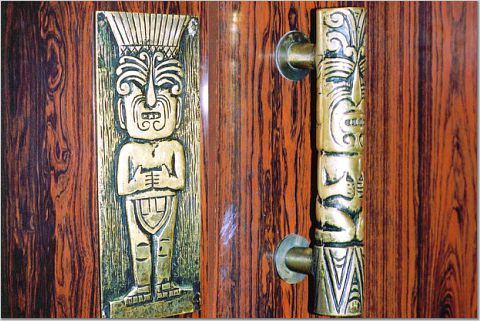 The Cattleman's Cafe in OKC, and Bali Hai in San Diego also have distinct door handles, particular to their specialities. 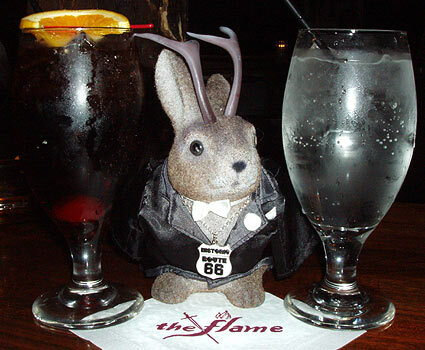 I should state right off that we did not eat at The Flame, we merely stopped for photos and sodas as we'd eaten so many places that day by the time we ran across it. Too bad, really. But that's Illinois 66 for you. 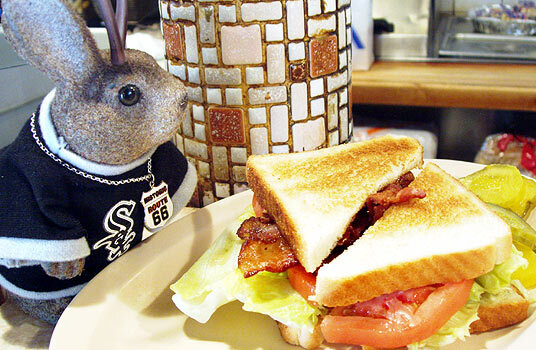 Indeed, I think of all the Route 66 states, Illinois seems to me to be the one you eat your away across to the greatest degree. 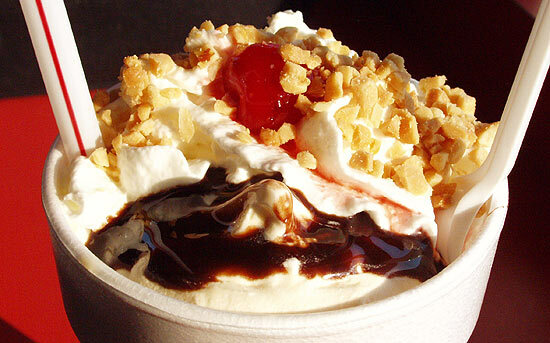 The day we stopped at the Flame, we'd already eaten at Lou Mitchell's, Snowflake Drive-In and Snuffy's Grill. 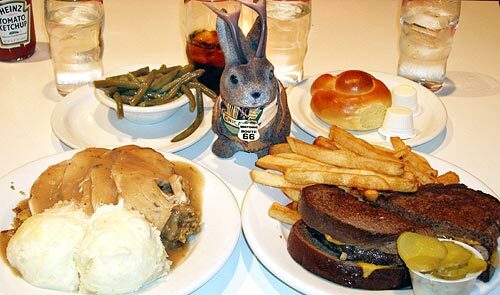 Truly, that day we ate no mediocre meals. 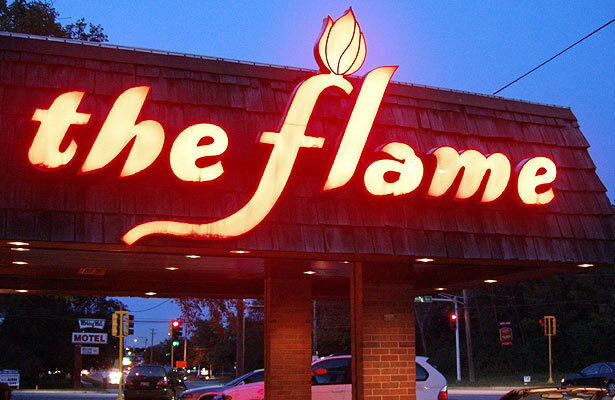 The Flame's decor is a mix of original features dating from 1949, and additions from the late 1960s and 1970s, according to several managers with whom I spoke. If I obtain more detailed information, I'll add it here. General Manager Lauri Galanti was happy to allow us to roam with a camera. 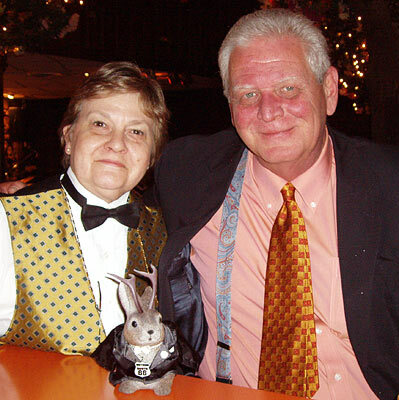 Here she is with Ace Jackalope and frequent customer Ray Hanzelin. 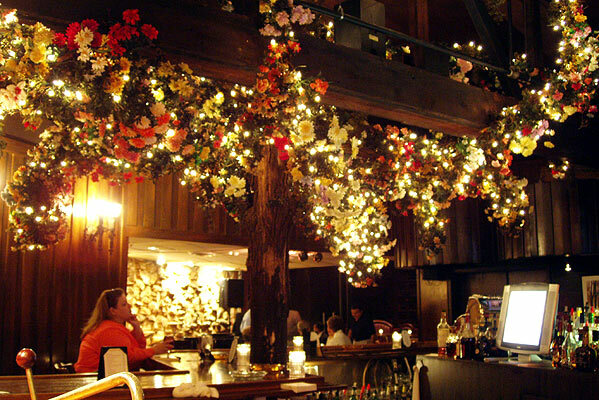 The bar lighting is subdued with lots of light-strew vine-like stuff. This huge end of a keg dominates a wall over the bar. 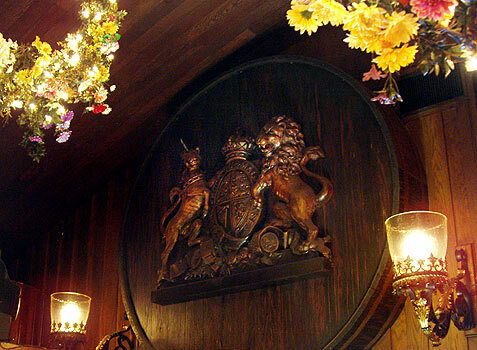 This banquet room is one of the additions. It looks very 1970s to me. 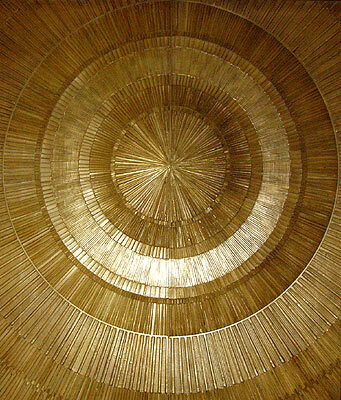 I was fascinated by the big metallic sunburst. 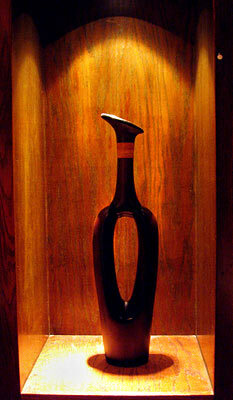 The restaurant has a definite mid-20th century feel. There are nice little touches here and there. Across Brainard Avenue from The Flame, you can see the sign for the Wishing Well Motel, another Route 66 institution. 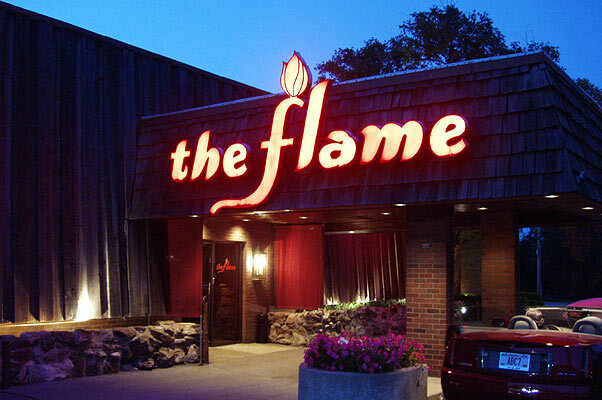 Yesterday via phone, I asked two Flame managers about the much-beloved but recently plagued motel across the street, and was told that demolition of it had begun in earnest last week. One literally looked outside and told me "they're tearing it down even as we speak." 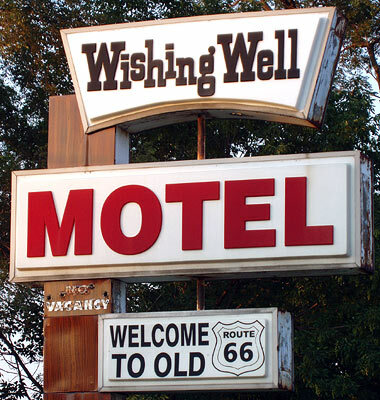 This was no surprise; the place was for sale when we were there in July of 2006, and Flame employees had told me that since Wishing Well owner Zora Vidas had passed away, there had been no parties interested in running the place as a motel. Part of it had even caught fire since then. 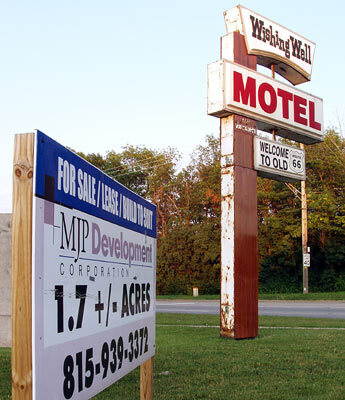 Route 66 news has carried periodic updates on the story of the motel's demise. I believe this sign is a replacement for an earlier one. Read a bit about the history of the 1941-vintage former motor court at Kathleen J. Miller's website. 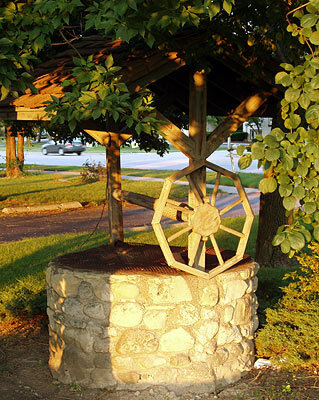 As of the afternoon of November 20, the wishing well itself was intact, according to Flame employees. Now this is funny. I pointed the camera through a wire grid and down the well that day last July, and shot a flash picture into the inky darkness of the well. Why? Because sometimes it's fun to photograph stuff you can't even see. Anyway, months later I was looking at these photos and noticed what looked initially like the lower half of some unfortunate person, still clad in their jeans. 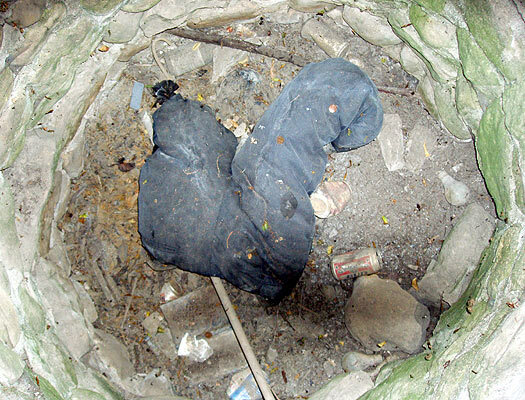 More likely, it's the remains of a Halloween dummy, posed coming out of the well but doomed to reside in it. I should note that I didn't smell anything odd. Who knows? - it might stay in there long after the well is filled (if it ever is) - a fun little find for some future archaeologist probing the cultural engine that was, and is, Route 66. 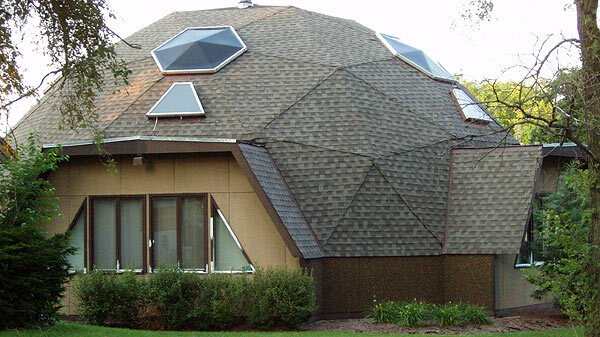 This geodesic house has nothing to do with The Flame or the Wishing Well, but I'm throwing it in anyway, as I'm a sucker for geodesic structures and I see few of them along Route 66 outside of Arizona. There were several of them just to the East of the Wishing Well.